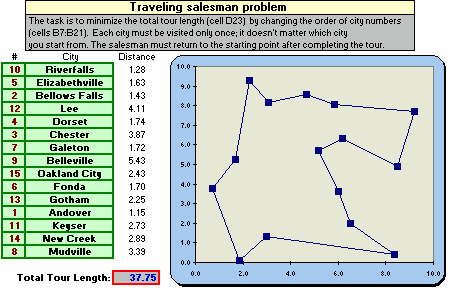 The Traveling Salesman Problem is a well known problem which has become a comparison benchmark test for different computational methods. Its solution is computationally difficult, although the problem is easily expressed. A salesperson must make a closed complete tour of a given number of cities. All cities are connected by roads, and each city can be visited only once. GeneHunter solves this problem by minimizing the value in cell D23, the total tour length, and by changing the order of the city numbers in cells B7:B21, the adjustable cells. Each city is assigned an ordinal number from 1 to N, where N is the number of cities. The city names and numbers are listed in a range called Map in Cells B26:E40. The tour is represented as the entire sequence of city numbers. Once the distances between all of the city pairs are computed (the distance between the last city and the first is also computed to close the loop), the entire tour distance is summed in cell D23, the fitness function cell that is minimized. Figure 5.11 TSP worksheet includes range called Map on right and range called Distances on left. 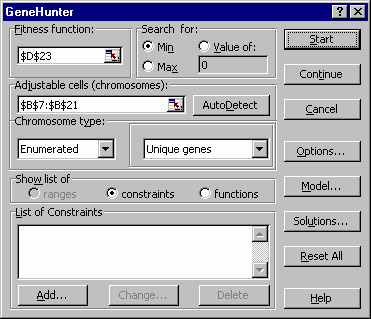 GeneHunter uses enumerated chromosomes and unique genes to solve this problem. The problem employs enumerated chromosomes rather than continuous chromosomes because the list of cities is finite: from 1 to 15. Selecting unique genes insures that each city appears only once in the ordered list of cities to be visited. Constraints are not required to solve the problem.